The last five weeks I’ve been following the FutureLearn MOOC ‘Start Writing Fiction’. Extraordinary. I’m on my second pass. I came through early, and now return not wanting to get ahead of the conversation. Particularly useful as I am actively writing at the moment, so this is the best of all learning because it is applied. Regarding character it about giving them shape, depth and ‘points of interest’ – more 6D than even the 2D we are asked to get away from. I visualise characters as hedgehogs with many prickles, but only a few of these matter to the story – though all of them matter to the notebook which I’m gradually coming to care about more and more, cursing the times I ‘have a thought’ and don’t get it down somewhere safely. I am hugely pleased to be here and very proud to be an OU graduate already – not, sadly, from this faculty: yet! Writing for myself from 4.00am to 8.00am. Picking up work from 10.00am. I am often ‘poolside’ teaching or coaching swimmers. Delighting yesterday evening to be back with some squad swimmers I last saw four years ago – now in the mid teens, some achieving amazing things in the water, all at that gangly stage of youth development my own children have come through in the last year. The issue then is how or where or why I fit in the OU module L120 I committed to. Learning a language is daunting and outside my comfort zone. What I do know now, not surprisingly, is that all learning comes about as a result of concerted and consistent effort over a long period of time. 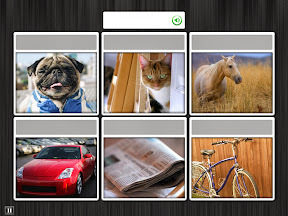 And some wonderfully expressed and illustrated that we’ve made it into a party game at home. My wife is word-perfect having gone to a French-speaking school for a year age 13 in Canada. She always picks me up on the ‘r’ – maybe I can finally crack this. I had elocution lessons as a boy age 7 as I couldn’t manage my ‘Rs’ in English, let alone the greatest challenge. Brilliant. Wonderfully put and comprehensive. Pilates for the British tongue. I still can’t quite manage ‘Bruno’ though – something about the mouth position for the ‘B’ to the ‘R’ – currently the equivalent of trying to do a standing backflip. Ce que je voudrais utiliser est la ‘réalité augmentée’. 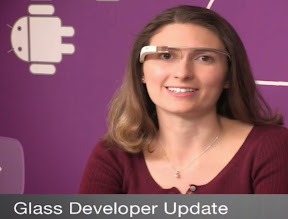 Soit à l’aide de quelque chose comme ‘Google Glass,’ le mot pour quelque chose en français pourrait se superposer automatiquement sur tout ce qu’on regard. Ou, quelque chose qu’on peut faire aujourd’hui serait de mettre un QR Code sur les objets autour de la maison et quand on prend un « téléphone intelligent » comme un iPhone, on verrait le mot en français devant le QR code. 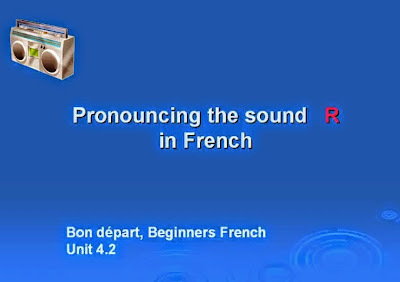 Learning French with The OU I am finding the toughest task is to kill my British accent. I’ve been using Rosetta Stone too. There are certain words with combinations of letters that fox the English tongue. You know you’re mastering French, for example, when you can differentiate between the subtleties of ‘de’ and ‘deux’. Do you want some croissants or two? You think you are saying you want two, they think you are saying some, they ask you how many, you repeat ‘some’ and you resolve the problem by holding up your fingers. ‘Trois’ and ‘quatre’ may flumox your British tongue too, so you perhaps go in wanting two of a thing, and end up asking for five, as ‘cinq’ is far easier on the English tongue. You then hide or eat the spare three croissants on the way back to the campsite? As I’m working with the written and the spoken word and I’m used to Googling everything I was delighted to come across a website that purports to help you correctly pronounce anything. I was toying with words such as ‘Victoire’ and who wouldn’t get their tongue tied with ‘Hesdigneul.’ This has to do with the FutureLearn Massive Open Online Course (MOOC) ‘Start Writing Fiction’ that I’m using to galvanise my writing once and for all … the trend is good, in ‘Write a novel in a month’ I’m on course to complete at the end of November. The ‘grin from ear to ear’ fun came when I looked up ‘Bruno’. I had a French friend in my teens called ‘Bruno’ and I could not, for the life of me get his name right. It always sounded like Bruno, as in ‘Frank Bruno’, the name you’d give to a bloodhound as it is so droopy. In French ‘Bruno’ is perky like a sharp dig in the ribs. 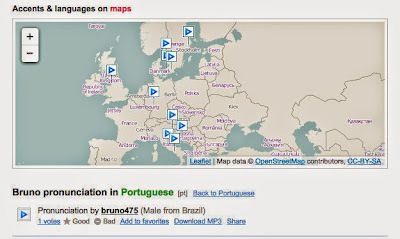 What this site does is it gives you sixty versions of how ‘Bruno’ is pronounced all over the world. Click on the UK, then somewhere in France and you’ll see what I mean. I laughed even more when I put my own name in, to hear ‘Jonathan’ said in a Swedish, Taiwanese, American, French and German accent. Life happened at the opening of the MOOC on Web Sciences from the University of Southampton (SOTON) – the imminent arrival of a great-grand child is announced while two in their late 80s make their departures, one with little warning, the other with a reluctant move to hospital. Keen as I am on ancestry I try to reflect on what has and is changing. How great in truth is or will be the impact on how we live, love and die? Of course the frenetic, massive Web impacts on the neuronal activity in individual brains feeding us with knowledge, news, information and misinformation like never before, but how much does it change the intimacy of a family, of childhood and education, of working and falling in love, of starting a family of your own (or not) and beyond? The Web, like a strange digital mist now surrounds us – but in the Darwinian sense does it change anything at all? 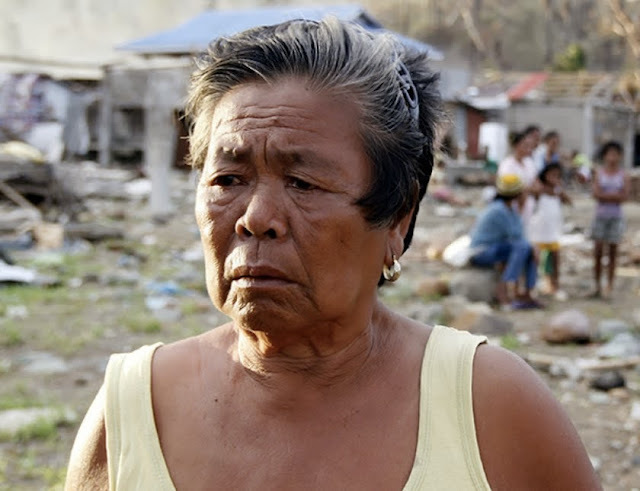 Words of a distraught young woman from the Philippines coming out of the recent typhoon smack you in your digital face when she starts with ‘no Internet, not smart phone, no food, no water, no roof on our heads, no medicine … ‘ We will surely reflect on that fact that for all the opportunities the Web it is exclusive and fickle. Yet it is the speed and ease by which this information is disseminated that changes things. I remember the Japanese Typhoon that I watched on multiple TV channels calling to my son who was watching the same online directly from people’s smart phones. The new arrival mentioned above was posted on Facebook, the ‘departure’ was a call to a mobile phone. Both will feature online to welcome to the world or to reflect on a long life and commiserate. At times you laugh out loud, always informative, great stories, full of well-known facts with a twist, as well as a myriad of gems. The kind of book I would have bought and sent to people for the pleasure of it … not sure how that works with an eBook. If Michael Palin had got stuck in Egypt for six years, without the film crew, he might have made a stab at it. I described Robert Twigger to my wife as Michael Palin’s mischievous younger brother. (I know Robert, though I’ve not seen him for twenty years). He’s exceedingly bright but very modest, even humble. A boffin you might find going through second-hand books in a pile at a charity shop. There’s an intimacy, cleverness and a flash of British funniness throughout. Encyclopedic whilst as readable as an unputdownable novel. For me this is the very best travel writing. I’ve bounced into it via a need to take an interest in ethnography in H809 Practice-based research in e-learning. I found myself watching ‘Seven Years in Tibet’ then reading the book by Heinrich Harer. 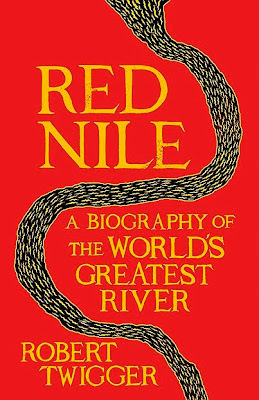 ‘The Red Nile’ is written in a similar vein, though Robert’s relationship is with the river and not the Dalai Lama. The book touches on a good deal of anthropological study of the peoples of the Niles (blue and white). It’s value is how easy it is to read after all the academic papers, and how quotable and informed it is too. ‘It seems peculiar to me that specialisation should involve developing a point of view that obscures the very subject you wish to study’. This is I will take as a warning as I venture towards doctoral study. My interest is in learning, and e-learning in particular. Learning can apply to many, many fields. We all do it whether we want to or not. Professor Uta Frith of University College London was on Desert Island Discs for the second time this week – this time round I paid close attention. I then went to the BBC website and took notes. Having recently completed the Open University postgraduate module H810 Accessible Online Learning and of course interested in education, this offers insights on what studying autism and dyslexia tells us about the human mind. There’s more in another BBC broadcast – Uta Frith interviewed for the BBC’s Life Scientific – Broadcast 6 Dec 2011 accessed 1st March 2013 – and available, by the way, until January 2099 should you not be able to find time and want your dyslexic grandchildren to listen. The difference between someone who is autistic and the rest of us is how we each of us see the world. We may all have some of this in us. Uta Firth wants knowledge of the brain to inform education the way knowledge of the body informs medicine. Professor Uta Frith is best known for her research on autism spectrum disorders. Her book, Autism, Explaining the Enigma (1989) has been translated into many languages. She was one of the initiators of the study of Asperger’s Syndrome in the UK and her work on reading development, spelling and dyslexia has been highly influential. Throughout her career she has been developing a neuro-cognitive approach to developmental disorders. In particular, she has investigated specific cognitive processes and their failure in autism and dyslexia. Her aim is to discover the underlying cognitive causes of these disorders and to link them to behavioural symptoms as well as to brain systems. She aims to make this research relevant to the education of people with development disorders and to contribute to a better quality of their everyday life. In Chapter 3, ‘Tools of the mind’, after a potted history of maps (not cartography) and clocks (not horology), we get an equally potty view of the plastic mind and neuroscience. Carr is no neuroscientist – three decades ago he took a first degree in English Literature (Dartmouth College) followed by a Masters in American Literature (Harvard). He should stick to what he knows. Though ‘The Shallows‘ is meant to be unavailable online I started to read a version someone has uploaded before the book arrived in the post. If I had the energy I would cut and paste the digital version into a two column table, landscape view, and write my notes alongside – like a translation. This is what I do with academic papers when they require and deserve close scrutiny. ‘The Shallows’, like any Airport best seller is only worth a once only skim read – I’m questioning my resolve even to do that. It is like being asked to eat six plates of jelly (jello) and custard. As a book it is a remarkably satisfactory artifact. Even in paper back the cover has a wonderful fine grittiness to it – like sand. I even open the book and breathed it in. For this experience 10/10. All publishers, especially those online, need to take trouble with the Art Work too. Of course the plaudits sing out ‘buy me, buy me’ but as reviews go they are about as helpful as one liners on the latest blockbuster. Carr writes well enough, not quite Bill Bryson, but an easy and intelligent read, an amble through the relevant technologies to the present day. Carr can be accepted as a cultural and social historian, his mistake is to want to want bash this evidence into shape to support his conception of the Internet and its dangers. It is like saying that ‘rural man’ is different to ‘urban man’, that the motivations, pace and opportunities are different. Whilst this may be true, the sorts of changes to the brain that Carr suggest are not occurring. Carr’s conception of mind is both out of date and misconstrued. I wonder if I have the strength to read on, not even to refute what he says chapter by chapter. I risk polluting my mind. The pleasure is the history, the cod science is irritating and unnecessary. Carr is well read and would be a pleasure at a dinner party, but I don’t suppose he’s much of a listener, nor someone whose views are likely to change no matter how convincing the evidence that his hypotheses are mistaken. My inability to concentrate on this book has nothing to do with what Carr will claim to be by Internet altered mind. I have some 8 books on the go, 4 eBooks, the others in print form by the bed. It simply fails to engage me, even on the level of making me angry. I suspect that Carr takes an evangelical view on his perspective and couldn’t be changed – I tried telling something reading the Da Vinci Code that it was all made up but they wouldn’t believe me. We human’s have it in us to take things on blind faith. Clearly this is a trait that has brought us in evolutionary terms a long way, but if you want a scientific perspective on the Internet you won’t get it from Carr. If anything, from 2000 when I started buying books in bulk from Amazon and from 20101 when I started consuming e-Books voraciously, the Internet has increased my hunger for books – for their content. My preference is for e-Books for their versatility. I used always to read with a pen and notebook by my side. I now do everything on the one device, adding notes, highlighting, bookmarking, sharing snippets to Twitter and Facebook along the way and blogging chapter by chapter too. I stop to check the meaning of a word, or to read a footnote, even to download and read a reference where it helps my understanding. I buy books that are only available in print – Marshall McLuhan, Christopher Alexander, Gordon Bell, Robert Gagne, Engestrom’s Activity Systems (certain specific editions). At no stage has Carr done either a research degree, or has he studied engineering or computer science or anything that might touch on the workings of the Internet such as e–learning. He should have studied criminal law as he is good at is constructing a plausible, one–sided argument. Nothing by Carr, from what I can see, has been published in an academic journal – it would not be accepted. Those who have studied the Web, psychology, and neuroscience, would shred him. p.48 on the mind is the exact same shallow and ill–conceived thinking touted by that other writer of bias and conjecture – Marc Prensky (the digital natives debacle is largely his, though currently he’s denying he started that ball rolling). The structural changes to our brains are infinitesimally minute and extraordinarily complex – a Mozart who has studied and played the piano, or a mathematician such as Einstein, have the same brain just as they have in human terms the same arms and legs. If their personality profiles are to be understood, one could imagine Mozart being the easily distracted, eclectic, butterfly online, while Einstein one imagines would treat it as a tool and an opportunity to stay even closer to the topics that mattered to him. One, in Kirton’s terms an ‘innovator’ the other an ‘adaptor’. This is where Carr’s lack of understanding of human psychology is so telling. This is twaddle on so many levels it feels no more possible or desirable to refute than the enthusiastic chatter of a child. Carr doesn’t strike me as someone who easily persuaded when he has something wrong. even those who do use it for a myriad of different things in a multitude of ways. years of solitary confinement, or years in the trenches on the Western Front affect different people in different ways. The Internet, as a changing and fluid platform of content, now on smartphones on smart TVs since Carr wrote ‘The Shallows’, where it impacts and changes our lives, the effect on each of us varies. Human kind is not homogenous. I got this kind of thing written on my undergraduate essays, in particular when I’d skipped lectures and based my research on back copies of the Financial Times (this would have been for a module on Southern Africa). ‘Journalistic’ was the put down. This is journalism to be serialised in a Sunday Colour Supplement – it would be acceptable if the view were balanced. I have in mind a book to complement ‘The Shallows’ – a snappy title might be ‘The Deep’ or ‘The Corrections’ but both of these have been used. An equally plausible stance would be to take everything Carr says and imply that it means the exact opposite – this would be just as imbalanced as ‘The Shallows’ though. The idea that the Internet is making ‘us’ profoundly smarter, that we are being re-wired into a super-race. Borgman, C.L. (2007) Scholarship in the digital age: Information, infrastructure, and the Internet. Cambridge, MA: MIT Press.